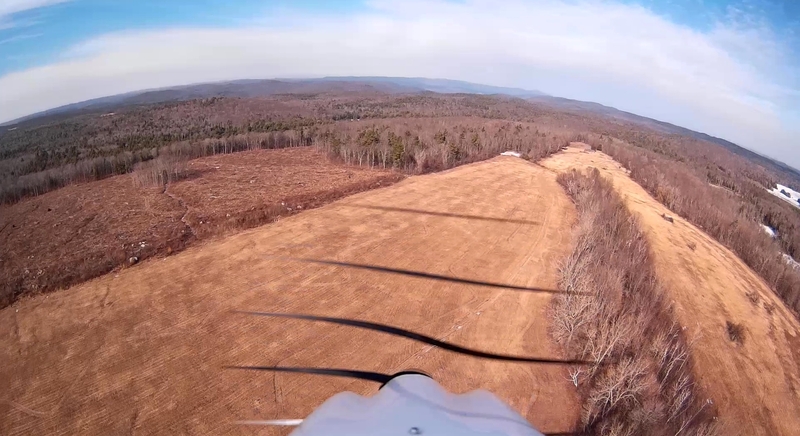 Here are sample images showing the power of UAS in capturing imagery that would otherwise never be seen by the public. It is important for citizens to see exactly what state land managers are doing to the land in pursuit of grant monies to fund their departments. It allows us to demonstrate how they violate the basic tenets of good land management and disregard science in favor of funding. CT DEEP Wildlife Division has been conducting forest clearcuts across the state to increase habitat for the declining New England cottontail (NEC) rabbit. They have also been vigorously advocating for such management on private lands. They have been remarkably successful in destroying forests in Connecticut. The same activity is happening in Massachusetts for the same reasons: the pursuit of grant money. 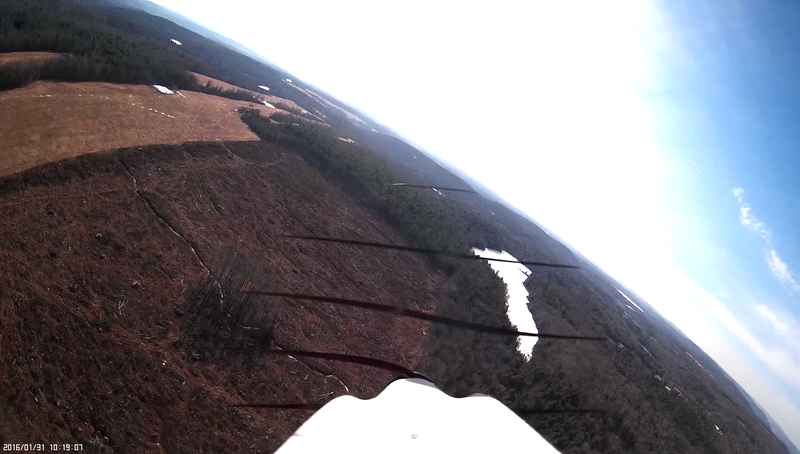 Goshen WMA, view S. Clearcut is dark brown area to R.
This was a recon flight over the Goshen Wildlife Management Area in NW Connecticut to document the spatial attributes of the 60-acre cut. Note that forest-edge effects radiate an additional 1000LF into the surrounding forest. The small woodland patch in the middle of the clearing was left to protect a listed endangered plant. Their plan is to let the clearcut advance to shrub habitat to accommodate the rabbit. The forest right here is post-agricultural, demonstrated by the leveled nature of the cleared ground, and probably 75-100 years old. The problem here is not rabbits but in management not backed by the latest science. The literature indicates that instead of clearcuts, NECs prefer 30% tree canopy cover. Thus, proper management will require several entries into this stand over the next 50-75 years to regrow and shape tree density and distribution into an optimal geometry for NEC. The costs required to do this work will not be funded by grants and thus DEEP will most likely just walk away from their stewardship obligations. 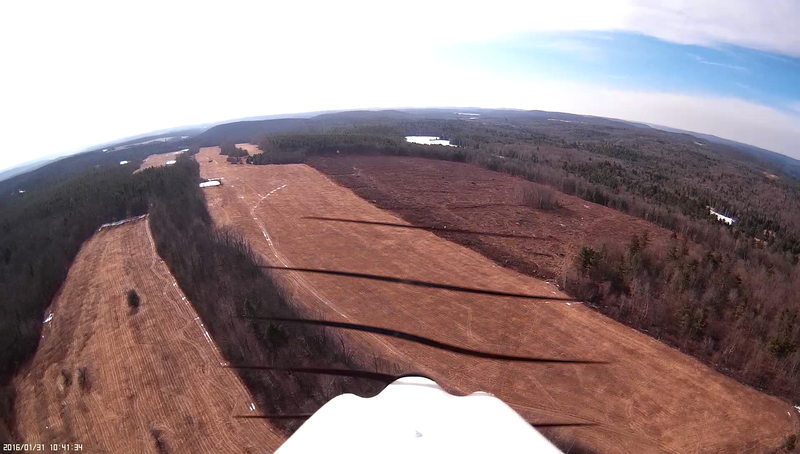 Goshen WMA, view W. Clearcut at 11:00 to aircraft. A second issue, unique to this site, is the listed rare plant population now isolated within a forest island. Fundamental ecology demonstrates that this population will probably collapse due to isolation, predation by deer and other herbivores and seed predators drawn to the surrounding early successional habitat, shifts in microclimate temperature and humidity that also affect soil moisture and chemistry, genetic contraction, and habitat invasion by non-native invasive species. Rare species are typically the most sensitive to change – they are dwelling on the edge of existence. DEEP has greatly pushed the rare species in this location to or beyond the edge of survival. Goshen WMA view SE showing tree island and daylighted brook. Also visible in the photograph is a spring stream that has been daylighted – an action that would never be possible for a private citizen without facing rigorous regulatory hurdles – and rightly so. DEEP should have been held to the same riparian buffer requirements as the common citizen. These images are textbook illustrations of the ways that fundamental tenets of landscape ecology, habitat ecology, and organism ecology are violated by state wildlife managers whose work was catalyzed by a coarse-grained funding flow from DC (mission: grow NEC) that clearly required a place-considerate fine-grained deployment framework supported by the latest science. Remarkably, the simplest path to the end result that they sought would have been to just let a hayfield compartment advance to the shrub stage: no-cost, natural process-driven management. Flight notes: EFlite Apprentice fixed-wing aircraft, Dragonlink 432MHz control, Mobius keychain camera, RMRC 1.3GHz video downlink. First published July 21, 2017. Next articleDoes the European Honey Bee (Apis mellifera) Impact Native Pollinators?